Bearwallow Mountain offers exceptional scenery in reward for a short hike! At 4,232 feet above sea level, with a grassy meadow at its summit, the mountain features a nearly 360° view that includes Mt. Mitchell and Mt. Pisgah. Its breathtaking vistas also includes a birds-eye view of Hickory Nut Gorge, downtown Hendersonville, and the high country of South Carolina. A historic fire lookout tower occupies the summit, as do grazing cattle who call the mountaintop home. The trail to the summit is approximately one mile each way. You can also follow a gravel road back to the parking area for a loop hike. Bearwallow is a great place to go for a short day hike or you can combine it with a hike on the Trombatore Trail, which starts at the same trailhead for a total seven mile hike. The trailhead is at Bearwallow Gap, located at the crest of Bearwallow Mountain Road where the road surface turns from gravel to pavement. Park on the graveled area on the shoulder of the road, next to the steep hillside. Please respect the adjacent property owner by not blocking the gate, road, or driveway or turning using the driveway to turn around. Space is available for only a few cars at this trailhead, so multiple hikers should consider carpooling. Conserving Carolina is planning improvements at this trailhead in the future. The trail begins behind a rust-colored metal gate. Walk around it on its right side by squeezing between the gate and a fence. The beginning of the trail is immediately on the right, marked by a kiosk, blazes, and a set of log stairs. Once inside the gate, locate the trail and the trailhead kiosk to the right of the gravel road. The trail switchbacks several times to begin its climb up the slopes of Bearwallow Mountain. Just beyond the half-mile mark, the path levels out, providing a breather as it curves around Bearwallow’s western ridge. 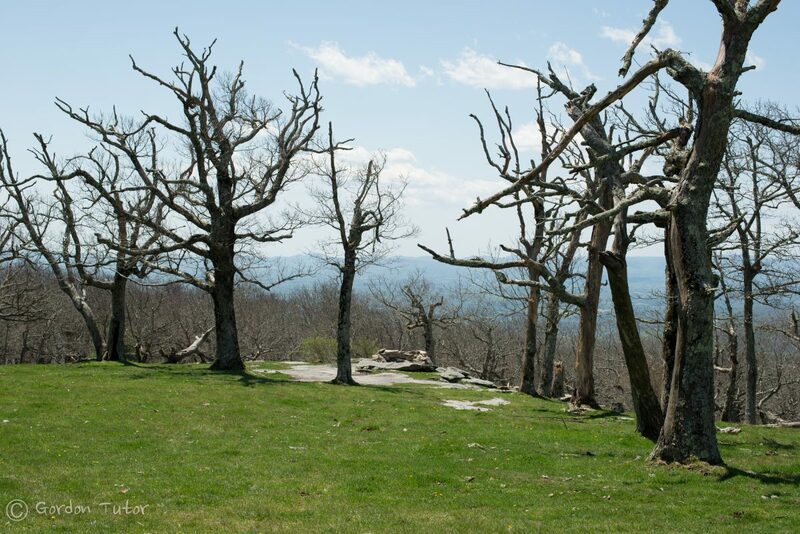 Once on the mountain’s northern slopes, keep climbing to reach the scenic summit meadow at 0.7 mi. Good views to the west and south are available as the woodland trail ends at the meadow. If you continue a short ways to the top of the meadow, you will be rewarded with panoramic views to the north, as well. The 4,232-foot Bearwallow Mountain is the highest peak in the Bearwallow Highlands range in Henderson County and the tallest summit of the Hickory Nut Gorge. It straddles the Eastern Continental Divide, which separates the Atlantic watershed from the Gulf of Mexico watershed. From this vantage point, you can see nearly 360 degrees, thanks to the grassy open meadow. 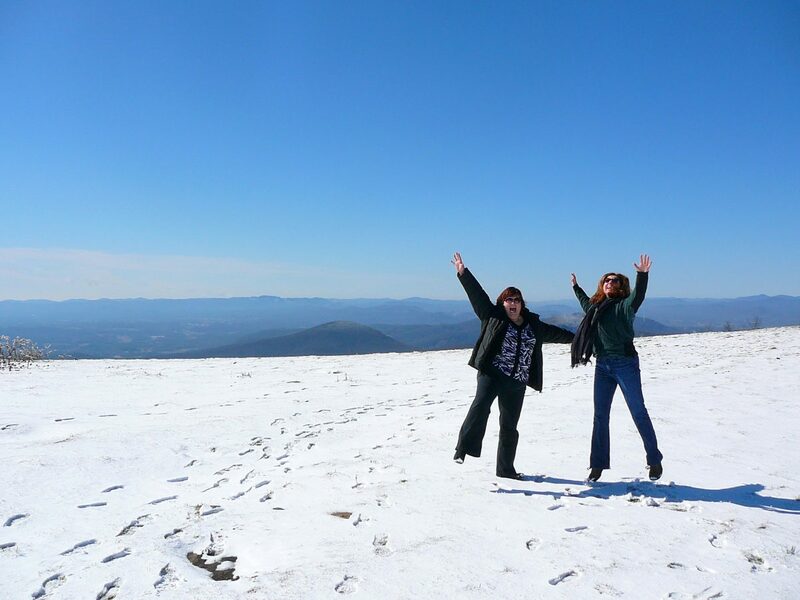 These views include some of the highest peaks in the Appalachian Mountains. To the west, you can see the Great Balsams and their highest peak, Mt. Pisgah, and further to the Great Smoky Mountains. To the south, you can see Hendersonville, Tryon Peak, and into South Carolina. To the east, you can enjoy a birds-eye view of the Hickory Nut Gorge, toward Lake Lure. To the north, you can see the Black Mountains and their highest peak Mt. Mitchell, the highest peak in the eastern U.S. at 6,683 feet. To return to the trailhead, you can either hike back the way you came, or follow a gravel road from the summit near the fire tower, downhill for a loop hike. If you’re going up for a sunset, full moon hike, or stargazing, remember to bring a light. Best Day Hike in Western North Carolina? 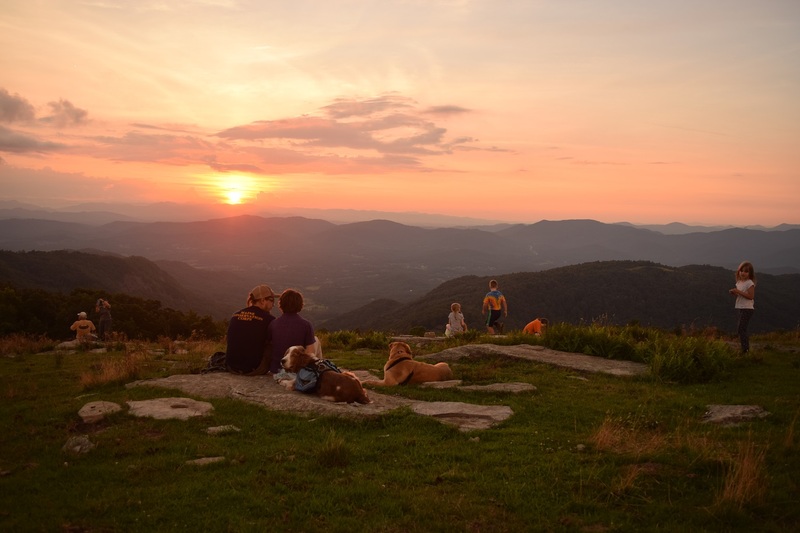 With all that going for it, we think Bearwallow Mountain is one of the best day hikes in Western North Carolina. Here are our top 10 reasons why Bearwallow is the best. What do you think? Please consider voting for Bearwallow when the Best of WNC contest comes around! Bearwallow Mountain Summit could easily be a subdivision of luxurious mountain homes. With views like that, they would sell for millions! But the Lyda family, which owns the mountaintop, didn’t want to see this beautiful land developed. Instead, they chose to protect it forever by granting a conservation easement to Conserving Carolina. 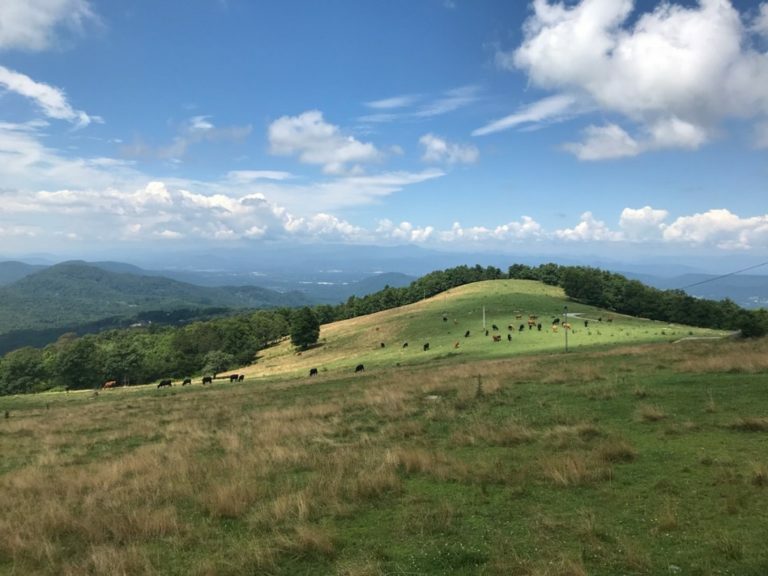 While most conservation easements on privately owned land do not allow public access, the Lydas chose to grant access for hikers so that all of us can enjoy the view. They continue to farm this land, grazing cows on the mountaintop. 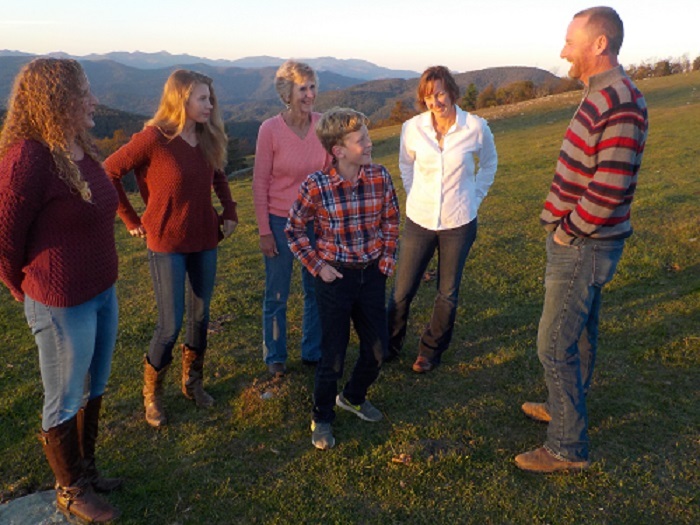 As the easement holder, Conserving Carolina is responsible for working with the Lydas and all future landowners to ensure that the terms of the conservation easement are upheld—making sure that the promise of land conservation for future generations is kept. The Lyda owns Bearwallow Mountain, which is a working farm protected by conservation easements. Conserving Carolina has been working with Lyda family to expand the protected land on Bearwallow since 2009, when we acquired a conservation easement on 81 acres at the summit. In 2013, we protected an additional 85 acres along its high-elevation ridgeline, followed by 5 more acres in 2015. In 2017, we protected over 300 additional acres between Bearwallow and Little Bearwallow Mountain, resulting in a total of 476 acres protected forever! So, what’s a conservation easement? It’s a voluntary legal agreement between a landowner and a land trust that permanently limits certain uses of the land—such as housing development, commercial logging, and excavation—in order to protect its conservation values, such as water quality, productive farmland, scenic views, wildlife habitat, and more. An easement allows landowners to continue to own and use their land. 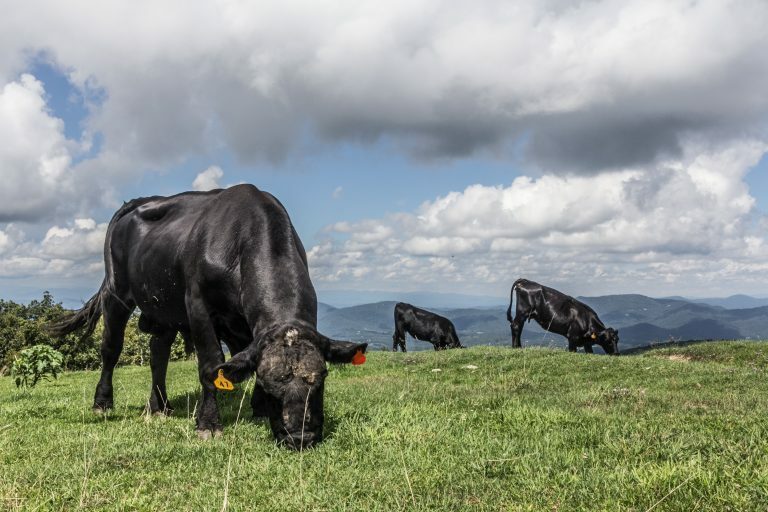 That’s why you’ll see cattle grazing on top of Bearwallow Mountain—because this grassy meadow is still part of a working farm. 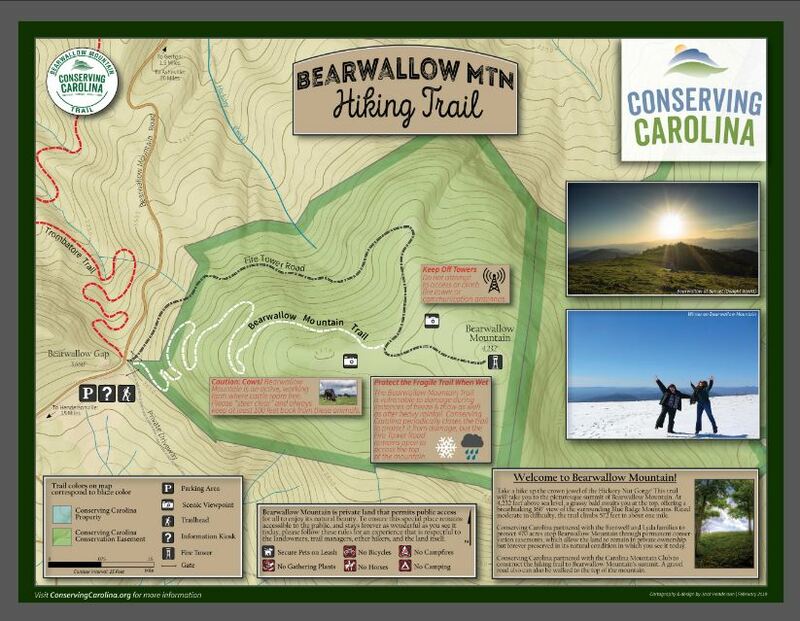 In 2011, Conserving Carolina constructed a new sustainable public hiking trail to the summit of Bearwallow Mountain with the help of the Carolina Mountain Club, REI Asheville, and community volunteers. This trail was the first segment in the Upper Hickory Nut Gorge Trail, a 20-mile hiking loop that will eventually link Bearwallow Mountain to lands Conserving Carolina has protected at Florence Nature Preserve, Little Bearwallow Mountain & Wildcat Rock. 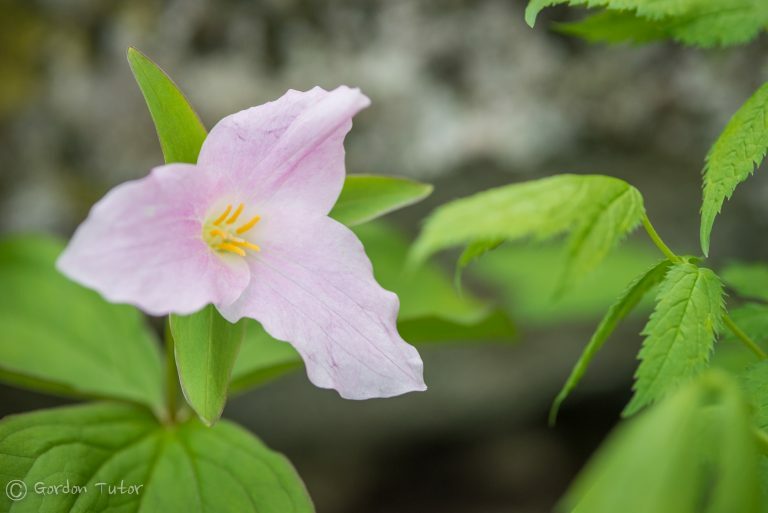 It will also connect to lands protected by our partners, the Southern Appalachian Highlands Conservancy at Blue Ridge Pastures and Hickory Nut Gap. Additional segments of the Upper Hickory Nut Gorge Trail are currently under construction. About 12 miles of the loop is currently completed, including Bearwallow Mountain Trail, Wildcat Rock Trail, Trombatore Trail, and Florence Nature Preserve trails. This loop will be part of the 100-mile Hickory Nut Gorge State Trail. The Bearwallow Mountain trail is on privately owned land, where the landowners have generously granted access for hiking. This is a working farm and you may see cows grazing on the summit. Please show respect for the landowners, your fellow hikers, and the natural environment. Keep your distance from the cows. Don’t litter. If you see litter, please pick it up and pack it out. Don’t cut switchbacks. Switchbacks are part of sustainable trail design, helping to prevent erosion. Climbing the fire tower is not allowed. Camping and campfires are not allowed. If you enjoy natural places like Bearwallow Mountain, please consider making a gift to Conserving Carolina. Your support helps us protect more great places and build more trails so we can all get out and enjoy the mountains! Looking for another sweet hike? Or maybe biking, fishing, paddling, picnicking, or rock climbing…. There are so many opportunities to get outdoors, whatever you love to do in nature.